Getting Very Excited about Thailand! With plenty of posts on getting around, budgeting, and destinations, Travel Happy is a site I find myself returning to over and over. I love Dan and Audry’s site, Uncornered Market — they’ve been traveling for 3 years and their site is a perfect mix of great concise writing, inspiring photos, and useful tips. They’re currently in Bolivia, but this older post from Thailand really has me jazzed to get on the road and stuff my face until I can’t walk. Shrimp and asparagus stir fry for 25 baht? Yes, please. 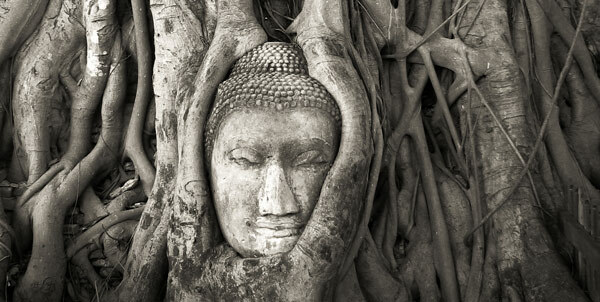 Legal Nomads has a great post on what to do in the crazy, chaotic city that is Bangkok. I’m really looking forward to landing here and exploring. I’ll eventually make my way to the more tranquil beaches and islands, but I know I’ll be drenched in adrenaline from the last minute trip preparations when I arrive. Sounds like a perfect time to dive into the madness. I’d be remiss not to mention the best independent travel guide I’ve found for SE Asia — tons of helpful, current information here. Highly recommended. if you make to Ayutthaya, be sure to hit up Uncle Lek for a stellar bowl of kuaytiaw reua, Thai boat noodles. He has a busy open-air joint right across the way from Wat Ratchaburana, one of the main temple sites right in town. if you will be spending a good chunk of time in Thailand, you might want to pick up a copy of “Thai Hawker Food”, should be able to find in Asia Books in Bangkok, or online here: tinyurl.com/crtlfc, very useful! learningthai.com/speak_thai.html; “mai aow khap” comes in handy to ward off persistent tuk-tuk touts in Bangkok. while we’re on it, here’s another useful resource for culinary explorations in the Kingdom: nachang.com/travelmenu, a downloadable menu for street eats from Chanchao, one of the regulars over on the Thorntree forum. Thanks sooo much for the links and tips. You rock!